Comodo System Utilities 4.0.226743.26 Portable » TopFreeSoft.Net - Best Freeware Software! 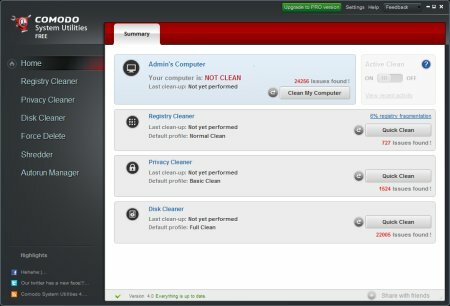 Comodo System Utilities is a file cleaner, disk registry cleaner, and privacy cleaner that includes our unique feature: SafeDelete. With SafeDelete, accidental deletions are a worry of the past. Remove any corrupt or unnecessary registry entries. Delete duplicate files and needless archives. Obliterate your digital paper trail. Boost your PC's speed by cleaning out its junk. Fingertip control over Windows programs. Privacy cleaner deletes cookies, cache, history, and usage records, helping to protect your privacy and identity. Windows registry cleaner identifies, removes or repairs any unnecessary or corrupted entries. Disk cleaner removes all the clutter from your disk drive to free up space and improve performance. SafeDelete lets Comodo System Utilities clean as deeply as possible without fear of removing something vital to your PC's performance. Comodo System Utilities's elimination of risk means it can reach deep into your PC and fully destroy any space-wasting junk. We've taken this ground-breaking feature and applied it to every aspect of CSU: the registry cleaner, disk cleaner, privacy cleaner, and duplicate finder. Users will also have access to a staggering menu of Windows customization options, to make your system perform exactly as you desire.